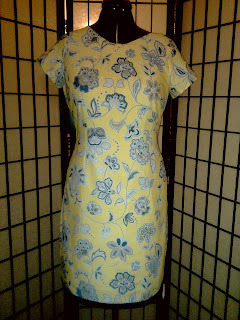 This is my second dress for the Stitch Up A Dress Challenge hosted by Faye. 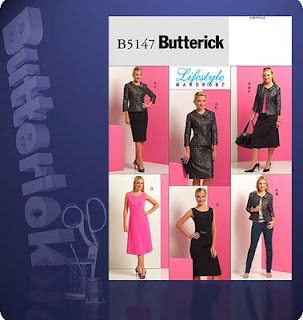 I revisited Butterick 5147, which I have made several times (version C) (2/10, 3/10, 3/10, 4/10, 8/10), but this time around I faced some obstacles. The obstacles were two parts, SWS (sewing while sleepy) and the fact that I only removed the pattern pieces and started cutting and sewing up the fabric outright and never looked at the instructions which had my modification notes on them. 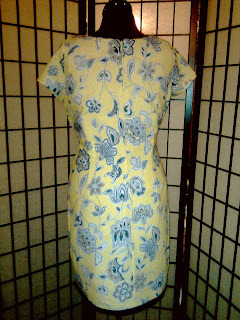 I used a yellow floral cotton blend fabric that I purchased from Bridge Street Fabrics some time ago. Assembled the dress and the lining and without thinking proceeded to attach the lining to the dress without trying it on prior to the lining installation. I guess in hindsight & sleepliness, thought why bother I made the dress several times, what could go wrong... right. Tried the dress on and the neckline was droopy in the front and standing away from my neck in the back... what the fasneezy!!!. It didn't help that I had just awaken from a long nap and still groggy, I just knew I was imagining the wonkiness and thinking mmmm maybe a bra would help. Tried it on again... umm nerp wonkiness still there. Also, the armhole was showing armpit cleavage... aww dayumm.. what is going on. Well I knew one thing for sure, I wasn't removing that darn lining, mind you the zipper was in and the lining was hand stitched to the zipper as well. Oh hells to the naw... no can do buddy, I wasn't ripping out one stitch. Mind you still didn't think to look at the instructions...0_o, honestly, at this point it was too late. My mind went into unethical mode, dart this situation with a quickness. I added darts to the front ... umm yeah definite designer element and sleeves from Butterick 5313 to eradicate the armpit cleavage. Yes, all is better now, albeit the unethicalness of the situation... The dress fits better along the neckline and did a final edge stitch to aid in keeping the darts flat. To finish off the dress I added 7/8" navy blue bias trim to the hemline and presto... Love It!!! This is my idea of a summer dress. 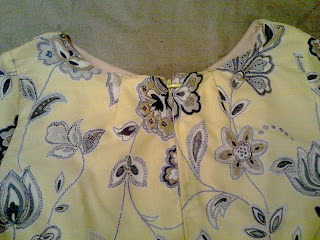 I have another dress cut, but not sure I will be able to finish it by the deadline. Father's day is this coming weekend and need to get the menfolk gifts completed. They have been asking for lounge shorts since the warm weather has gone into effect and need to get started on them. Faye Thank You for another Awesome challenge and looking forward to the next challenge. Way to make it work! I love the trim at the bottom! I can tell you stories about sewing when sleepy, LOL! But you did a great job saving your dress. Looks great on you. Shelia - THANK YOU, for taking the time to participate in the challenge. Think the next one will probably be in the fall. You did a great rescue of the dress, but I'm trying to figure why you termed it unethical. Was it because you darted the back neckline without taking the lining loose? I do understand that a girl's got to do what a girl's got to do when called for. Oh gosh, what a beautiful dress! And you look very lovely wearing it --- well done Sheila! What a great save! Love those designer moments. It's lovely fabric. SWS.....great! This is a very pretty dress, and I really like the hem treatment. I love how you just went for it, and your fixes just look like design elements!! There are no mistakes in sewing, only design opportunities. I just read that recently; obviously you took advantage of those design opps. Great job on saving the dress! Way to make it work, very cute dress, I really like the trim. Sheila you did a great job on your dress and as Tim Gunn would say " make it work" and you did. 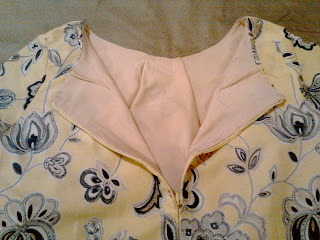 In fact most A-line vintage dressess have darts in the neckline. Great job! Great save! I am all about lopping sh*t off, tuck here, and dart there when I need it. Very nice job. Lovely fabric. You did a great save job. Love the title of the blog post but I would have just called it Designer Sewing! :) You just added your own spin to the pattern - cause I scrolled down and saw the dress first and asked where did she get the dayum sleeves from!!!! Seriously though, love the blue trim you added to the bottom of the dress. It definitely took it to the next level! This is a very pretty dress on you! Beautiful! I love the fabric. Nice save. Gurl you "Tim Gunned" the hell out of that dress! Good for you! 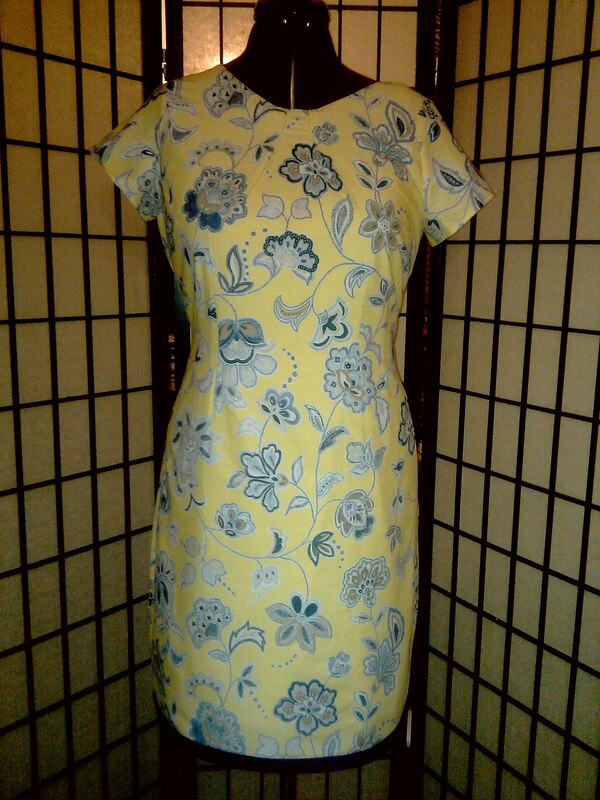 Shelia, you get my sewing mojo going when I see what you are creating! Love the dress. The fabric screams summer! The key to a fine seamstress is her ability to "make it work" in a bind and you sure delivered!! Very cute dress! That is a great dress, who would have thought your mistakes could take such a wonderful turn. Yep, you are my kind of seamstress. Beautiful dress! Lol! This post had me laughing and it ended on a good note and a great dress! Love how you made those designer elements work for you. You've created a beautiful summer dress! Nice work! The fabric is pretty and I love your finished product! It looks great on you! I don't think creative solutions are unethical, especially when they look this good! Wow you sure do whip these things up quick! I looove the fabric you chose and of course it looks great on you as always! Well, I wouldn't call any of those methods unethical. Sometimes a seamstress has to do what a seamstress has to do. The dress is beautiful !!! I love it and would definately buy it. Looks like a Macy's dress to me ! Woman, I feel like you're in the room talking to me with the "nerp's" and especially the "dayumm's!" You crack me up! Awesome dress - love the touch on the bottom! Hi Sheila! First time visitor, love the dress and your style. I'm a plus size. Do you ever line garments with cotton? The usual fabrics just make me overheat. Any suggestions? Thank you for all the lovely compliments. I wore the dress this past Thursday and looove it, with all its unethical drama...lol A co-worker complimented on the dress and went on to say how he really like the neck design. You know I was in total giddy land. @ Faye: I termed it unethical because I should have removed the lining from the fashion fabric and did the darts individually. 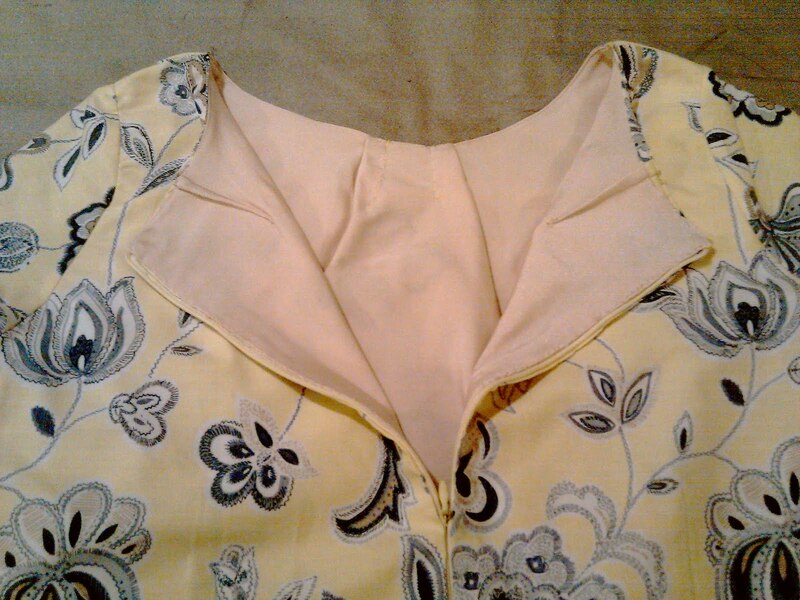 After putting the zipper in and attaching the lining by hand, I couldn't see removing them to add darts. Hi Libby and Thanks for visting. 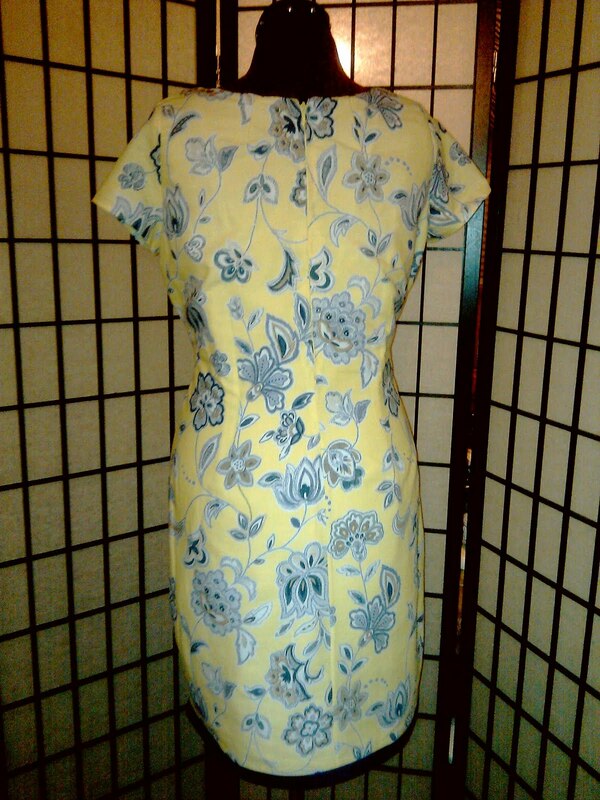 I have never lined with cotton, normally use stretch or polyester fabric. 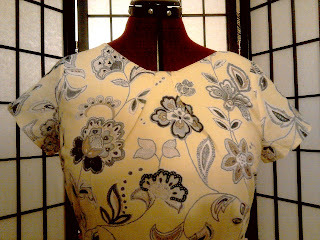 Just recently started thinking about it when I cut out a dress using georgette fabric. You can definitely use cotton. I like the border around the bottom.